Fruit is a little issue for us at the moment. We are only able to source apples and pairs at this time of year and as we get a weekly order from Kent Veg Box we have ended up with masses of apples. More apples than we can ever get through. The pears Lucan hoovers up pretty quickly but the apples are his second favorite and so don’t get eaten so quickly. We have had to start getting innovative with apples. If you have any great apple recipies please let us know! This one is loosely based on an Amish recipe but has been given a unique Bradshaw twist. It really is exceptionally good. One thing to note is that there is actually no butter in this recipe at all. The butter element in the title refers only to the buttery consistency of the apples in the finished jam. 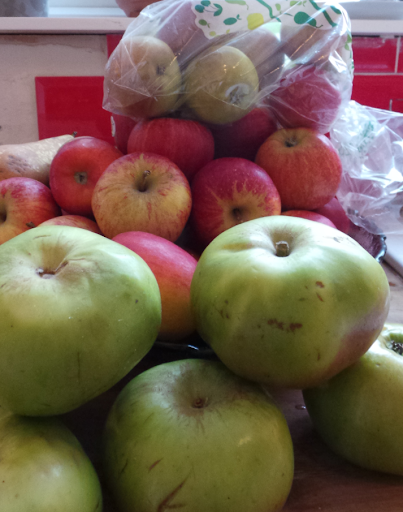 2lbs apples – we used cooking apples but will in future try a mixture of anything that is going. Quarter the apples core, skin, stalk and all and place in a a heavy bottomed pan with the cider vinegar and water. Cover and cook gently for about 20 minutes or until the apples are cooked through and mushy. Pass the apple mush through a fine sieve to remove the skin, pips etc. Weigh the apple mush and put back into the rinsed out pan with an equal weight of sugar, the juniper berries and a small pinch of salt. Simmer this mixture stirring as often as you can for about 1-2 hours. Be careful not to let the mixture catch on the bottom as it burn quickly and spoil the flavour. Once the mixture is thick and a dark amber colour put it into sterilized jam jars and leave to cool. Serve on warm buttered toast for the most amazing mouthful of wintery goodness. Sounds great, will have to try that one. I love apple crumble – very standard I realise, I have also used over-ripe apples in pork casserole before, that was tasty. Apple juice: If you have a good quality juicer, then 6-8 eating apples(not cooking) makes just enough juice for x 3. In November I tried out the Juice masters 7ilbs in 7 days(amazing healing results) but my shopping list for first 3 days included of 35 apples to start with!! Get juicing…. the benefits are super healthy.Most people would not eat 8 apples in one sitting, but juicing is so much quicker and your children drink super juices with no additives. The pulp that is left is perfect for the compost!! If you need more info , just let me know. 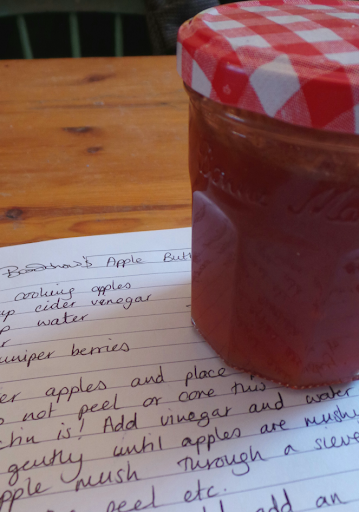 Apple chutney: there must be recipes out there ?? I like making apple butter too. We have a couple of trees which usually give us a huge harvest, but this year we weren’t so lucky. I use the following recipe changing the quantities in proportion with what I want to use. 12oz sugar to each pint of resulting puree. (Whispers – I normally add a teaspoon of ground cinnamon but I guess that’s why you’ve used juniper berries, I shall have to give that a try). It is the most lovely thing on toast these snowy winter mornings. Here’s a simple dessert recipe, caramelized apples. Melt the butter over a low heat in a large non stick frying pan. Take the pan off the heat. Peel, core and slice the apples thickly dropping the slices into the butter as you cut them. Fold them into the butter as you go so that they do not discolour. Add the sugar and cook on a medium heat for 2-3 mins stirring to dissolve the sugar. Turn the heat to high and cook for 8-10 mins until the apples have caramelized lightly. Serve with some cream or yoghurt. If you can find a suitable british spice and some suitable british nuts you can add these with the sugar, or chops some of the nuts and lightly toast them to sprinkle on top of the cream. I usually make this just before I’m about to serve the main course so that it’s warm by the time I serve the dessert, otherwise the caramel could be too hot to eat especially for a small person. I have apple trees, and I dry some of the apples. Peel and slice thinly, dip into water with lemon juice, or salt ( to stop them going brown). Pat them dry then put on trays in a low low oven ( or a dehydrator) for 8+ hours. I am still eating mine. Or make fruit leather- keeps for a year and you can mix with other summer fruits. If packed well apples will last for ages. My Dad, when I was a child, used to pick the apples out of grandmas orchard, wrap them in newspaper then put them in a cardboard box where they would keep in the garage for years. Nearly all supermarket fruit, especially apples, will have been picked around twelve months before they are shipped to the UK to be packaged then sold. Thanks for the recipe tips! Mine is spiced apple cake. I use a Victoria sandwich mix which is equal quantities of butter, sugar, eggs and flour. I then add a couple of teaspoons of cinnamon or mixed spice to the mixture. I slice apples into the bottom of a cake tin then pour over the cake mixture. The cake is delicious eaten warm or cold. Interesting tips in the comments too and particularly good to hear about wrapping the apples in newspaper to keep them in the garage for years. Now, that’s where I was a bit cagey, Anna, when I added the caramelized apples recipe. Normally when you add the sugar, you also add a quarter tspn of cardamom seeds, and an eighth of a tspn each of ground cinnamon and ground cloves, 3 tbspns of slivered almonds and 2 tbspns of chopped walnuts. Well you might find British almonds and walnuts if you know someone with a tree of either, but it’d be hard in the shops, and the spices aren’t going to be British, so I left that bit to Emily and James’ imagination. Also the cream or yoghurt is normally topped off with some chopped pistachios. Another problem ingredient. Your spiced apple cake sounds lovely though, I shall probably give it a try. Thanks. It’s great fun and very relaxing searching the web for recipes. It’s a fantastic resource and free. Try apple curd. Just like lemon curd but with apples. Its lovely and sealed properly will last ages and ages. Fantastic on toast, as a butty or as apple-meringue pie. Sounds great have you got a recipe?